Here is the list of the hotels near Saint-Jean-de-Savigny. Book your hotel near Saint-Jean-de-Savigny today, Tuesday 14 May for the best price, reservation and cancellation free of charge thanks to our partner Booking.com, leader in on-line hotels reservation. Below here is the list the 50 closest hotels of Saint-Jean-de-Savigny, sortable according your criteria. You will find the position of these accommodations on the Saint-Jean-de-Savigny hotels map. Guest accommodation Sainte-Marguerite-dʼElle Preferred hotel ! Offering a barbecue and views of the garden, La ferme de la Baconnerie is set in Sainte-Marguerite-d’Elle in the Lower Normandy Region, 23 km from the D-Day landing beaches and 24 km from Bayeux. This accommodation is made of 4 detached holiday homes with enclosed garden. Free private parking is available on site. Each holiday home features a living room with seating area and a dining area. A flat-screen TV and DVD player are provided in each accommodation. There is also a kitchen equipped with a dishwasher, an oven and a washing machine. La ferme de la Baconnerie features free WiFi . This pet-friendly property also offers grocery delivery and banquet facilities can be reserved at an extra cost. A reception room for 50 people is available upon request. You can play table tennis at the property, and the area is popular for hiking. Isigny-sur-Mer is 16.5 km from La ferme de la Baconnerie, while Caen is 48 km from the property. Caen Carpiquet Airport is 50 km away. Housed in a 16th-century manor house, Les Rochers offers B&B accommodation in Cerisy-la-Forêt. Certain units include a seating area for your convenience. You will find a coffee machine and a kettle in the room. Each room has a private bathroom. Extras include free toiletries and a hairdryer. A homemade single dish dinner paired with a beautiful wine selected out of a menu with more than 100 labels can be requested, at an extra cost. The bed and breakfast also offers free use of bicycles. Caen is 42 km from Les Rochers, while Bayeux is 20 km from the property. The nearest airport is Deauville – Normandie Airport, 76 km from Les Rochers. Gite Les Rochers is a detached holiday home set in Cerisy-la-Forêt in the Lower Normandy Region and featuring a garden with a barbecue. The unit is 42 km from Caen. The kitchen comes with a dishwasher, an oven and a microwave, as well as a coffee machine. A flat-screen TV is available. Free use of bicycles is available at the property and the area is popular for hiking. Bayeux is 20 km from Gite Les Rochers, while Courseulles-sur-Mer is 39 km away. Deauville – Normandie Airport is 76 km from the property. Situated in Moon-sur-Elle in the Lower Normandy region, Moon Cottage is a 3-star property boasting free WiFi. Guests staying at this holiday home have access to a patio. The 3-bedroom holiday home is fitted with a living room with flat-screen TV, a fully equipped kitchen with oven, and a bathroom with a shower. Guests at the holiday home can enjoy a continental buffet breakfast. Moon Cottage offers a barbecue. Guests can also relax in the garden. Caen is 49 km from the accommodation, while Bayeux is 26 km from the property. The nearest airport is Deauville – Normandie Airport, 83 km from the property. Situated in Cerisy-la-Forêt in the Lower Normandy region, Holiday Home La Maringote is a 4-star property boasting free WiFi. Guests staying at this holiday home have access to a fully equipped kitchen. The holiday home features a TV and a living room. Caen is 46 km from the holiday home, while Bayeux is 21 km from the property. Deauville – Normandie Airport is 90 km away. Gite De Blagny is situated in Saint-Clair-sur-lʼElle. Guests staying at this holiday home have access to a fully equipped kitchen. The holiday home has a flat-screen TV and 4 bedrooms. Bayeux is 32 km from the holiday home, while Saint Lo is 10 km away. The nearest airport is Deauville – Normandie Airport, 101 km from Gite De Blagny. Situated in Moon-sur-Elle in the Lower Normandy region, Cabanes de moon has a terrace and lake views. This lodge offers barbecue facilities. With direct access to a patio, this lodge comes with 1 separate bedroom and a fully equipped kitchenette. If you would like to discover the area, hiking is possible in the surroundings. Bayeux is 29 km from the lodge, while Saint Lo is 15 km from the property. Deauville – Normandie Airport is 99 km away. La Chapelle is located in the countryside of Moon-sur-Elle. You can relax on the terrace and enjoy the garden. Free WiFi access is available. The rooms feature a garden view, a desk and a fireplace. Each room comes with a private bathroom with a bath or shower and free toiletries. Breakfast is included in the rate and served each morning in the dining room. Other facilities offered at the property include a shared lounge and a games room. The property also offers free private parking. Located in Villiers-Fossard, Domaine de la Palombe offers accommodation with free WiFi and a garden with a children's playground and lake views. Some units have a dining area and/or a patio. The country house offers a continental or buffet breakfast. Domaine de la Palombe offers a terrace. Bayeux is 36 km from the accommodation. Deauville – Normandie Airport is 104 km from the property. Located in Litteau in the Lower Normandy region, Calvados Normandy Holiday Lodge features a garden. The accommodation is 48 km from Caen. This lodge includes a living room and a flat-screen TV, an equipped kitchen with a dining area, and 1 bathroom with a shower and a washing machine. The lodge offers a barbecue. If you would like to discover the area, cycling is possible in the surroundings and a bicycle rental service can be arranged. Bayeux is 23 km from Calvados Normandy Holiday Lodge, while Courseulles-sur-Mer is 45 km away. The nearest airport is Deauville – Normandie Airport, 92 km from the property. Offering a barbecue and children's playground, Hebergement au domaine de Litteau is situated in Litteau. There is a water park on site and guests can enjoy the on-site bar. Caen is 40 km away. Free private parking is available on site. Hebergement au domaine de Litteau features free WiFi . Hebergement au domaine de Litteau also includes a sun terrace. The property also offers mini-market. Yoga classes, fitness classes and a personal trainer are available at an extra charge. You can play table tennis at the property, and bike hire is available. You can engage in various activities, such as horse riding and fishing. Bayeux is 21 km from Hebergement au domaine de Litteau. Deauville – Normandie Airport is 75 km from the property. Located in Litteau, 23 km from Bayeux, Mobil-home Domaine de Litteau offers accomodation in a secured park. It boasts a covered pool and a children's playground. Free private parking is possible on site. The Mont Saint Michel is a 1 hour drive away. This mobile home has a living room, 2 bedrooms, and a kitchen equipped with an oven, a fridge and a coffee machine. Guests can enjoy their meals on the terrace. Mobil-home Domaine de Litteau also includes an indoor pool. Guests can enjoy a drink at the on-site bar. The property also offers mini-market. Entertainments are available every evening. Saint-Lô is 14 km from Mobil-home Domaine de Litteau, while Caen Carpiquet Airport is 38 km away. The area is popular for horse riding. Guests can enjoy various activities in the surroundings, including cycling and fishing. Camping de Litteau is located in the Normandy Region, within 30 km of the Landing Beaches. The property proposes self-catering accommodation, an outdoor and indoor swimming pool, a water slide, children’s playgrounds and entertainment staff from the April. All mobile homes feature a patio with BBQ facilities, a seating and dining area and a private bathroom. The kitchen is equipped with a radio, an oven or microwave and a stove. Guests can choose to dine at the snack bar or grab a quick snack from the takeaway on site. A grocery shop is also conveniently located in the campsite and bread, pastries and BBQ coal can be bought there. Additional features include 2 fishing ponds, bicycle rental, pétanque, table tennis, laundry facilities and a bar. There is also a beach volleyball pitch Caen is a 45-minute drive away and free private parking is possible on site. Offering free WiFi and garden views, Gîte des Forges is an accommodation located in Saint Lo. This holiday home features a garden. The holiday home consists of 2 separate bedrooms, 1 bathroom, and a seating area. The accommodation is fitted with a kitchen with a dishwasher and oven. The holiday home offers a terrace. Haras of Saint-Lô is 6 km from Gîte des Forges. The nearest airport is Deauville – Normandie Airport, 103 km from the accommodation. Guest accommodation Litteau Preferred hotel ! Featuring barbecue facilities, a garden, and a terrace, Grange de la Motte provides accommodation in Litteau with free WiFi and garden views. The accommodation is 48 km from Caen. This holiday home comes with a seating area, a flat-screen TV, a DVD player and a kitchen with a dishwasher. The property also has 1 bathroom with free toiletries. The reception at the holiday home can provide tips on the area. Guests can also relax in the shared lounge area. Bayeux is 23 km from Grange de la Motte, while Courseulles-sur-Mer is 45 km from the property. The nearest airport is Deauville – Normandie Airport, 92 km from the property. Located in Litteau, Le Manoir de Herouville is 14 km from the centre of Bayeux and 28 km from Omaha Beach. It offers free Wi-Fi access, individually decorated rooms and a terrace with garden furniture. This 18th-century manor house includes heated guestrooms with a seating area, a flat-screen TV with satellite channels and a wardrobe. The private bathroom is complete with free toiletries and a hairdryer. Guests are invited to enjoy breakfast every morning at Le Manoir de Herouville. This property is 25 km from the A84 motorway and 16 km from Saint-Lô. Free private parking is available on site. Located in Litteau, La Coulombe du Manoir de Herouville is 21 km from the centre of Bayeux and 28 km from Omaha Beach. It offers free WiFi access, individually decorated rooms and a terrace with garden furniture and a hot tub. This 2-bedroom cottage includes a seating area with a fireplace and a TV with satellite channels. The bathroom is complete with a hairdryer and a shower. Guests can prepare their own meals at La Coulombe Manoir de Hérouville. The kitchenette is equipped with a stove, kitchenware and a coffee machine. An electric kettle and BBQ facilities are also provided. This property is 25 km from the A84 motorway and 16 km from Saint-Lô. Free private parking is available on site. Situated in Litteau, Normandy Getaways at Mis Harand offers accommodation with seating area. Complimentary WiFi is featured. There is a fully equipped private bathroom with shower and free toiletries. A continental breakfast is served every morning at the property. The bed and breakfast offers a seasonal outdoor pool. Guests can also relax in the garden. Caen is 50 km from Normandy Getaways at Mis Harand. The nearest airport is Deauville – Normandie Airport, 93 km from the accommodation. Set in Le Molay-Littry in the Lower Normandy region, Gîte du Vieux Pressoir has a terrace. The property was built in 18th century, and features accommodation with free WiFi. The holiday home is equipped with a flat-screen TV. The kitchen comes with an oven and a microwave, as well as coffee machine and kettle. Caen is 43 km from the holiday home. The nearest airport is Deauville – Normandie Airport, 86 km from Gîte du Vieux Pressoir. Located in Le Molay-Littry, just a 20-minute drive from Bayeux, Chambre d’Hotes La Queue au Loup offers a garden. The D-Day landing beaches are only 25 km away. Accessed by a private entrance, the room features a terrace, a garden view, TV and wardrobe. It also has an en suite bathroom. A continental breakfast is provided each morning at Chambre d’Hotes La Queue au Loup. It can be served in the comfort of your room or on the terrace. Additional features include free Wi-Fi access throughout and free private parking on site. Saint-Lô is only a 25-minute drive away and Caen is 44 km from the property. Le Moulin Bérot offers accommodation in Saint Lo, 1.3 km from Haras of Saint-Lô. Providing free WiFi, the property also has a garden. This holiday home features a flat-screen TV, a seating area, a kitchen with a dishwasher and 1 bathroom with a shower. The holiday home offers a terrace. Hiking can be enjoyed nearby. The nearest airport is Deauville – Normandie Airport, 115 km from Le Moulin Bérot. Featuring a garden and a terrace, La Bucaille is an old family house located in Planquery, 20 km from Bayeux and 35 km from the landing beaches. It provides free WiFi access. With high ceiling and wooden floors, each room has a private bathroom with a hairdryer and free toiletries, and an outdoor seating area. Beds have old-stale sheep wool covers. Homemade jam, cakes, yogurt, juice and fruit are served for breakfast when booking a guest room. A kitchen equipped with microwave, oven, coffee machine and electric kettle is also at guests' disposal. You will also have access to a shared living area with a fireplace and a lounge with a TV. A sauna is also available for you to enjoy. A washing machine, a tumble dryer and ironing facilities are also provided. The property offers free parking. Offering a barbecue, Les etangs de planquery is located in Planquery, 43 km from Caen. Bayeux is 18 km away. Free private parking is available on site. Some units include a dining area and/or balcony. The units feature a dry toilet and bathroom facilities can be found nearby. Toilet facilities can also be found outside the accommodation. Guests can enjoy a drink at the on-site bar. Guests can enjoy various activities in the surroundings, including fishing and hiking. Ouistreham is 57 km from Les etangs de planquery, while Courseulles-sur-Mer is 42 km from the property. The nearest airport is Deauville – Normandie Airport, 101 km from the property. Located in Le Dézert in the Lower Normandy region, Holiday home Le Dezert with a Fireplace 415 is a 3-star property boasting free WiFi. Guests staying at this holiday home have access to a fully equipped kitchen. The holiday home includes a living room with a TV and a DVD player. Saint Lo is 12 km from the holiday home, while Carentan is 21 km from the property. La Crémaillère sits on the ramparts in the central district of Saint-Lô known as La Manche. Its restaurant serves traditional cuisine in a relaxed atmosphere. Each soundproofed room is equipped with a private bathroom with a bath or shower. Flat-screen TV and a free Wi-Fi connection are also provided. A continental breakfast is served each morning and the bar is open for afternoon and evening drinks. Free parking is available on site. Les Petites Aunettes offers accommodation in the village of Vaubadon, in a 6000m² park and a 5 minute drive from Balleroy-sur-Drôme. Free private parking is available on site. Les Petites Aunettes features free WiFi . The chalet include a flat-screen TV. It offers a seating area to relax in after a busy day. You will find a coffee machine in the room. The bathroom features a walk-in shower. For your comfort, you will find free toiletries and a hairdryer. Caen is 35 km from Les Petites Aunettes, while Bayeux is 13 km away. Deauville – Normandie Airport is 69 km from the property. This Mercure is situated 500 metres from the train station, next to the river and opposite the historic city walls in Saint Lô. It offers free Wi-Fi. Guest rooms at the Mercure Saint Lô are equipped with a TV, telephone and en suite facilities. They are accessible by lift. Breakfast is available daily. There is also a bar and a restaurant that serves traditional French cuisine. In summer, this can be enjoyed on the terrace that overlooks the city walls. The Mercure Saint Lô offers easy access to the city centre on foot. Points of interest include Notre-Dame Church, the church of Sainte-Croix, and the largest horse farm in France. Camping le Clos de Balleroy offers self-catering chalet and mobile homes with an outdoor swimming pool and children’s playground. A tennis court, table tennis facilities and hot tub are available for free. The chalet and mobile homes feature a living room with TV, a bathroom with shower and a kitchen equipped with microwave and stove. Some also have a terrace and BBQ facilities. There is a snack-bar on site and a bar, restaurants and shops just 800 metres away. Free Wi-Fi is provided in public areas, free private parking is possible and a laundry is available at a surcharge. Guests have access to the beach 25 km away or can go mountain-biking and hiking in the area. A games room is available on site where guests can play billiards, at an extra cost. Bayeux Train Station is 16 km away. 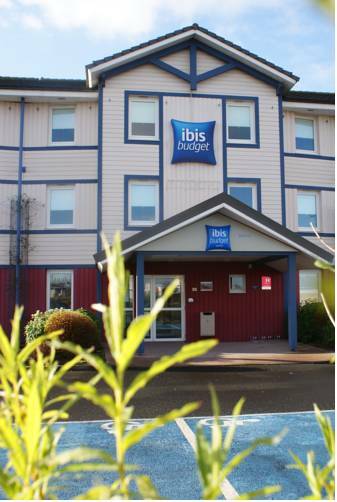 The ibis budget Saint Lô is located 3 km from the centre of Saint Lo. It offers air-conditioned rooms, a 24-hour reception desk and free on-site parking. Free Wi-Fi is available throughout the hotel. The soundproofed rooms are equipped with satellite TV and a private bathroom with shower. The rooms are accessible by lift. The hotel serves a buffet breakfast each day. There are a number of restaurants nearby. The hotel is accessible from the A84 motorway. Hotel Saint Lo Preferred hotel ! Brit Hotel Saint-Lô is located less than an hour from the Mont St Michel and the D-day beaches. It offers rooms with free WiFi access and a spa and wellness centre, which includes a sauna and a hot tub. Each room at Brit Hotel Saint-Lô has a work desk and a bathroom with shower. Guests can enjoy a buffet breakfast every morning. There is also a bar and a terrace. Several restaurants can be found in close proximity to the hotel. Brit Hotel Saint-Lô also offers free parking and is easily accessible from the N174 motorway, linking Rennes, Caen and Cherbourg. Set in Condé-sur-Vire in the Lower Normandy region, Charmante et apaisante chambre d'hôte en campagne features a garden. The property has garden views and is 38 km from Bayeux. The bed and breakfast is fitted with a flat-screen TV. A continental breakfast is available each morning at the bed and breakfast. Charmante et apaisante chambre d'hôte en campagne offers a terrace. Guests at the accommodation can enjoy darts on site, or go cycling or hiking in the surroundings. Saint Lo is 8 km from Charmante et apaisante chambre d'hôte en campagne. The nearest airport is Deauville – Normandie Airport, 111 km from the bed and breakfast. Located in Lamberville, château de lamberville features accommodation with a garden, free WiFi, a shared kitchen, and a shared lounge. Housed in a building dating from 19th century, the bed and breakfast is in an area where guests can engage in activities such as cycling and table tennis. The bed and breakfast includes a kitchenette with a fridge and a stovetop, as well as a coffee machine. A continental breakfast is available every morning at the bed and breakfast. Fishing and hiking can be enjoyed nearby. Caen is 47 km from château de lamberville, while Bayeux is 32 km from the property. The nearest airport is Deauville – Normandie Airport, 91 km from the accommodation. The Contact Hôtel Lunotel Saint Lô is located near junction 5 of the N174 motorway, 2 km from the centre of Saint-Lô. It offers a garden, a terrace and a children’s playground. Free Wi-Fi access is provided. Each soundproofed room has an en suite bathroom, flat-screen TV with satellite channels and free Wi-Fi access. A telephone is also available. The Lunotel Saint Lô restaurant serves traditional Normandy cuisine and packed lunches. Guests can relax with a drink in the hotel bar and enjoy the hotel’s buffet breakfast every morning. Guests of the hotel can visit the nearby Bayeux, Caen, the landing beaches and Mont Saint-Michel, which can all be reached within an hour by car. Free public parking is available on site. La Beauconniere is a farmhouse B&B located in Lamberville. Each room here will provide you with a patio, a terrace and a seating area. Free WiFi access is available and free private parking space is provided on site. Each guest room has views of the garden and a seating area. A private bathroom is complete with a bath or shower, free toiletries and a hairdryer. Extras include an outdoor seating area, bed linen and ironing facilities. At La Beauconniere you will find a garden, barbecue facilities and a terrace. Meals prepared by the hosts can be served if you reserve in advance. There is also shared use of the breakfast service kitchen for the preparation of light evening meals. An array of activities can be enjoyed on site or in the surroundings, including hiking. The property offers free parking. La Beauconniere is 33 km from Bayeux and 38 km from the D-day landing beaches. Guest accommodation Graignes Preferred hotel ! Entre Ciel et Marais is located in Graignes. This holiday home offers accommodation with a patio. The holiday home features 2 bedrooms and a fully fitted kitchen with an oven. Saint Lo is 19 km from the holiday home, while Carentan is 16 km away. Offering free WiFi and garden views, Les Chaufourniers/L'Etable is an accommodation situated in Crouay. This property offers access to a terrace. This holiday home features 2 bedrooms, a satellite TV, and a kitchen with a dishwasher. Caen is 37 km from the holiday home, while Bayeux is 11 km away. The nearest airport is Deauville – Normandie Airport, 81 km from the property. Below here is the hotels map of Saint-Jean-de-Savigny. Names and details of Saint-Jean-de-Savigny hotels can be shown on the map clicking on the prices icons.